Think back to the last time you were offered a credit card. What do you remember most: the deals and rewards the card offered or it’s APR, fees and fine details? 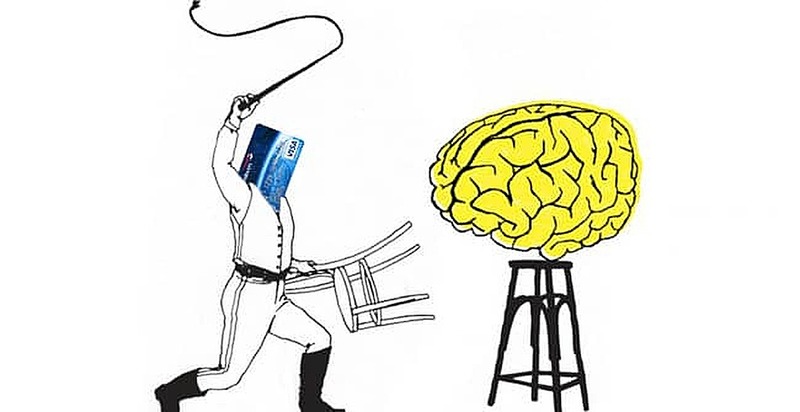 Credit card companies make billions of dollars a year through clever accounting and finance technique, but the vulnerability of the human brain may be their most valuable tool. These tricks come from theories grounded in behavioral finance, a study that blends psychology and consumer finance. We spoke with some of the nation’s leading university professors who have an deep understanding of behavioral finance to reveal the tricks credit card companies play on us every day. Have you ever had a retail cashier offer you a new credit card in return for a discount? According to Itacha College Professor of Marketing Michael McCall, this trick not only helps stores build brand loyalty, but also appeals to our inner desire for all things frugal. On its face, we like the deal because it helps us save money, but it also also be tapping into a more profoundly primal part of our minds. Things like a new store credit card. When you’re using a credit card, you’re spending your own money, right? Not quite. Every dollar you spend through your card is borrowed from the issuing bank and doesn’t actually affect your wallet until you make payments on those debts you owe. Markman said this tactic distances people from their money and is a fundamental element of not only credit cards, but casino gambling. If you want to get back some of your hard-earned money, consider opening a cash back credit card. Which sounds more attractive — a 12 percent APR credit card or a credit card with zero percent APR for the first 12 months before it switches over to 12 percent? In this regard, credit cards have a lot in common with “freemium” cell phone games. It costs nothing to start playing, but both freemium game developers and credit card companies are banking on you spending money eventually. Once the card companies have you signed up on those temporary low rates, they’re betting on the fact it’ll be difficult (or at least inconvenient) for you to switch cards. Consider opening a low APR credit card if you want to avoid the introductory offer hustle. This last tactic is probably the most obvious, but we’d be remiss to leave it out — rewards, rewards, rewards. Who doesn’t love the idea of getting a free gift or vacation every once in a while? But perhaps “free” is a bit misleading. In order to get these deals, you have to accumulate points by spending money, and typically the money you spent far exceeds the pricetag for whatever gift or reward you’re receiving. “One bit of language they use is to get you to think of the experiences you can have by spending money rather than the money itself,” Markman said. If you can use credit cards responsibly, consider opening a credit card with excellent points and gifts. Are these techniques manipulating us? Yes, but is it wrong? Not necessarily. Credit cards are tools, and like any tool, they can cause damage if used incorrectly or irresponsibly. McCall and Markman do not support or endorse the products offered on this site.